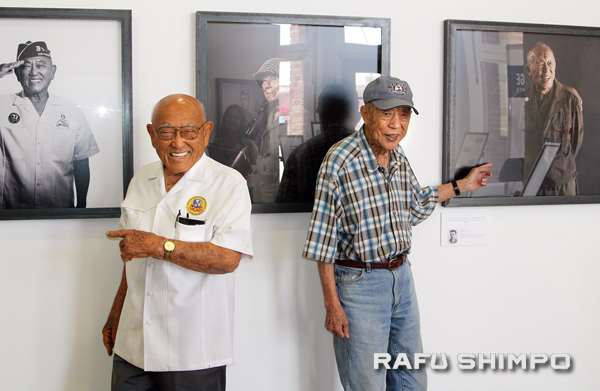 “Portraits of Courage,” featuring 12 large prints of Japanese American World War II veterans, is on display through June 10 at Go For Broke National Education Center, 355 E. First St. (at Central) in Little Tokyo. The exhibit is based on “The Go For Broke Spirit,” a book by photographer Shane Sato and oral historian Robert Horsting. 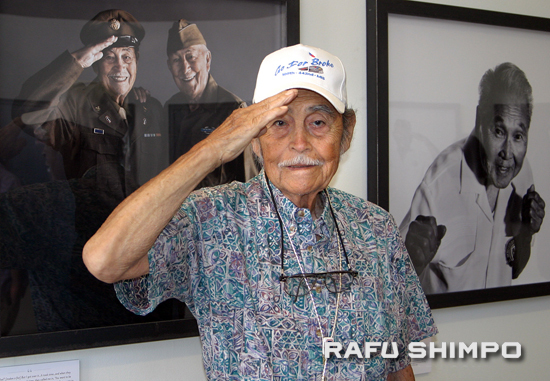 Since 2000, Sato has shot over 120 portraits of Nisei veterans, 81 of whom appear in the book. Around 2007, he began photographing them in World War II-era uniforms. Admission to the exhibit, located on the ground floor of Go For Broke, is free; visitors must still pay to see the “Defining Courage” exhibition upstairs. Toke Yoshihashi (442nd) and Hitt Ohara (MIS) point to their portraits in the exhibit. 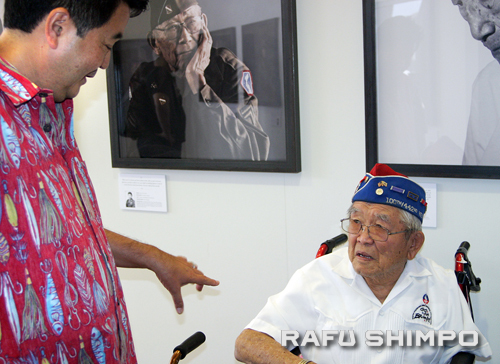 During the opening weekend, May 5 and 6, Sato, Horsting and several veterans were on hand to interact with visitors. Oral historian Robert Horsting and photographer Shane Sato. 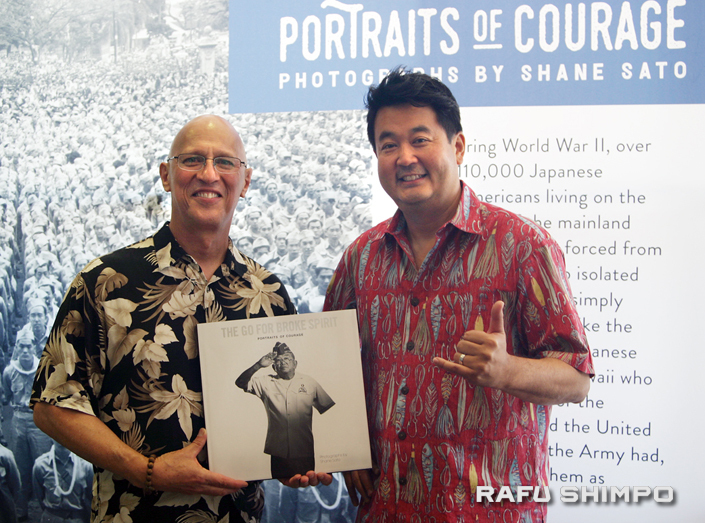 Photographer Shane Sato chats with 442nd veteran Don Seki. The plan is to take the exhibit on the road, but the next venue has yet to be determined. • Hitoshi “Hit” Ohara, Military Intelligence Service. Born in Fresno, he was drafted out of the Manzanar camp in 1944. He and other Nisei soldiers were trained to act like Japanese imperial soldiers in possible tactic scenarios for American soldiers. • Corporal Fernando Joseph Sosa, F Company, 442nd Regimental Combat Team. Born near Downtown Los Angeles, he was eager to join the U.S. Navy. However, to his surprise, he found out that he was half Japanese and was sent to the 442nd. He was eventually sent to Europe, but the war had already ended by the time he arrived. His duties included guarding German prisoners of war. 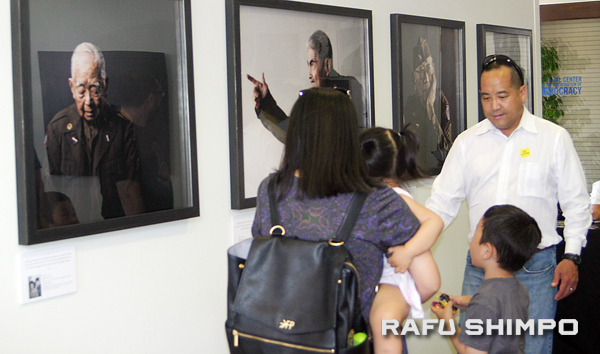 Visitors of all ages attended the opening of “Portraits of Courage” at GFBNEC. Operating hours are Tuesday, Wednesday, Friday and Sunday, 11 a.m. to 6 p.m.; Thursday, 12 to 8 p.m.; and Saturday, 10 a.m. to 6 p.m. Closed Monday. For more information, call (310) 328-0907 or visit www.goforbroke.org. For information on the book, visit www.thegoforbrokespirit.com.